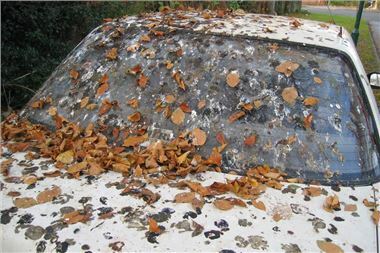 Research from Autoglym reveals bird dropping 'acidity' has no effect on paintwork. Damage actually results from cooling paint lacquer contracting and moulding around deposits. Autoglym warns motorists to act fast and with care to prevent lasting damage. New research from Autoglym, the UK's leading car care experts, suggests that the familiar sight of car bodywork 'etched' by bird droppings are not the result of any corrosive property in the deposit, as is commonly believed. In fact, damage instead results from the paint lacquer contracting upon cooling and moulding to the uneven texture of the hardened deposit. As paint lacquer warms - in the direct summer sunshine for example - it softens and expands. At the same time, that heat dries and hardens any bird droppings on the surface. Autoglym's researchers discovered that as the paint lacquer cools, overnight for example, it contracts, hardens and moulds around the texture of the bird dropping. To the naked eye, this moulding at a microscopic level appears as dulled or etched paintwork. The light's reflection is interrupted by the imperfect surface, unlike the undamaged paint surrounding it which gives a clearer reflection. Autoglym's tests with strongly acidic, neutral and strongly alkali bird dropping substitutes highlighted negligible differences in the damage caused. However, differences in paint damage were noted when the substitute bird deposits had varying degrees of grain-to-liquid content. A grainier texture caused greater light distortion (dullness) when the paint moulded around it. Wax and polish treatments - that protect against chemical attack from acid raid and UV sun damage, for example - provide limited protection from the paint moulding to bird droppings, although they will make them easier to remove. The longer the deposit remains on the bodywork, and the higher the temperatures, the harder the dried deposit will be, and the greater the propensity for the paint lacquer to mould to it as it cools. Remove the deposit at the earliest opportunity with a moist cloth - Autoglym's Bird Dropping Wipes are ideal - to gently lift the deposit from the surface. If the deposit is dry or doesn't lift easily, place a moist cloth over it for ten minutes to soften the deposit. Dispose of any cloth or wipe used to remove bird droppings immediately and carefully wash your hands, as bird lime can harbour diseases. Paul Caller, CEO of Autoglym, said: "It's a great shame when an otherwise fabulous-looking car is blighted with a tell-tale patch of dull paint. As a result of this new research by our R&D team in Letchworth, we now understand why bird droppings are a frighteningly potent hazard to bodywork. "As bird droppings become ever more prevalent through spring and into summer, motorists must be extremely vigilant to avoid permanent damage, especially those who park their cars under trees at home or at work. The only way to prevent the paint becoming noticeably tarnished is to carefully remove deposits as swiftly as possible."